Although I wrote this article for builders of the John Smith organs, it became apparent to me that commercial organ builders may also be interested in this double-acting bellows system, as it offers several advantages over the conventional system, and is much easier to make. I have never seen this idea before, but I do not claim it to be original. In the hundreds of years that organs have been built, I am quite sure that somebody else must have thought of this before me! I would be interested to learn if anybody has ever seen this idea before. I did present my idea in the Busker Organ Forum over a year ago and nobody has yet said that they have seen it before. One of the leading UK experts and collector in the mechanical organ field has also told me that he has never seen the idea before. He thought it might not work - but it does work, perfectly! 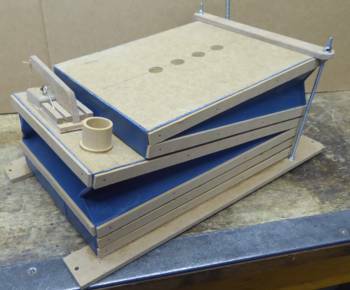 Full instructions and photos for making one of these pump units for a John Smith Busker or Universal Organ are given in this article. To make the organs easy to build, one compromise that John Smith had to make in his organ plans was to use single-acting bellows. Commercial organs almost always use double-acting bellows which supply air on both the down stroke and the up stroke. John got around this by using two bellows working in opposition, which has the same effect; but each bellows is only half the width, so the whole system only supplies half the wind of a conventional system. 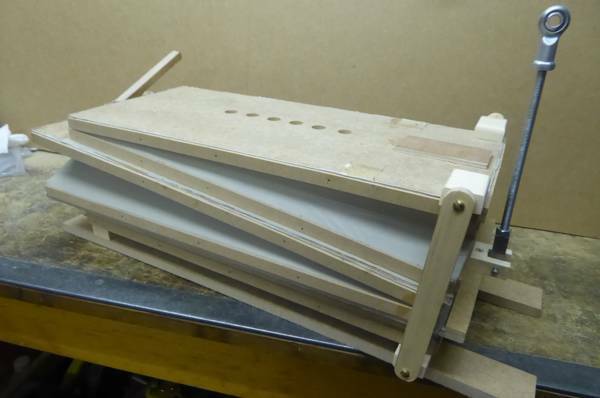 Double-acting bellows are quite difficult to make for the amateur builder. There are complicated blocks of wood to machine, and internal wind channels to drill, and the geometry is more complex. But after much thought, I have come up with a double-acting bellows system which can be built just as easily as the John Smith single-acting one. My system will supply more than twice as much wind as the John Smith system, and it only needs a single crank to operate it. My idea is similar to the conventional double-acting system which has two bellows one above the other, and a reservoir mounted on the top. The trouble with this is that the bottom bellows has no direct access to the reservoir. This has to be provided by a complicated angled hinge block with internal wind channels and a small flap valve. Also, the top bellows is sandwiched between the bottom bellows and the reservoir, and has no direct access to the atmosphere, except by further internal channels that come out of the side of the bellows. On paper this idea seems to be bonkers and would never work (which could be why it's not been done before?) but it works perfectly. 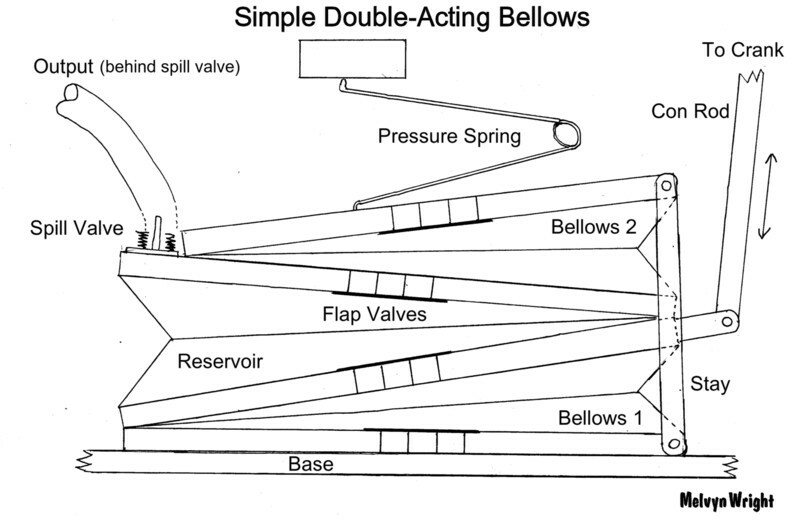 The hinge end of the reservoir is at the opposite end from the bellows hinges, so that as the reservoir opens and closes it does not affect the opening and closing of the bellows. You can see from the diagram that when the reservoir expands, all it does is to push the hinge of the top bellows up a bit, which does not affect the operation at all. Similarly, the hinge of the reservoir moves up and down with the crankshaft, but this doesn't affect the operation either! The bellows and reservoir are all made using the same simple techniques as used in the plans. They are just mounted in a different position. They can all be made individually and then glued (or screwed) together, simplifying design, construction, covering, and maintenance considerably. Only a single crank is required, which makes the crankshaft considerably easier to make than the double crankshaft in the Busker, or the triple crankshaft in the Universal. Because of the various fitments required on the reservoir (the output connection, the relief valve, and the pressure spring) it is necessary for the top bellows to be about 2" shorter than the reservoir. But in the conventional double-acting system both bellows have to be 3 or 4" shorter than the reservoir because of the bulky hinge block carrying the air passages. The pressure spring presents no problem as it simply presses down on the top bellows! The top bellows board does not move up and down, so the effect is just the same as if it was pressing down directly on the reservoir. Because of the slight sideways movement of the reservoir, the spill valve should be operated by a length of cord connected to the bottom reservoir board. The two stays must be at the corners, otherwise when the reservoir opens it will restrict the movement of the bellows. These are only under tension, so do not need to be very strong. Thick wire could be used. 1) Both bellows have direct access to the reservoir and also to the atmosphere, so no complicated internal airways and hinge blocks are needed, and the air movement is less restricted. 2) There is no restriction on the size of the flap valves. 3) Will supply more wind, due to the absence of the hinge block. 4) All three bellows assemblies can be built entirely separately and then glued (or screwed) together, or the whole thing can be made as a single unit by the more experienced builder. 5) All of the three bellows assemblies have simple geometry, with both boards being of equal length and converging to a point. This makes measuring and glueing the bellows cloth/leather much easier. 6) The height and capacity of the unit is adjustable, simply by lengthening or shortening the stays. So for example if it is found to supply more than enough wind, the height can be lowered by shortening the stays, to take up less space in the organ (and vice versa). Of course, the crank throw would also need to be changed to suit. 7) With no complicated airways, and simple bellows construction, I believe the potential for air leaks is much less. 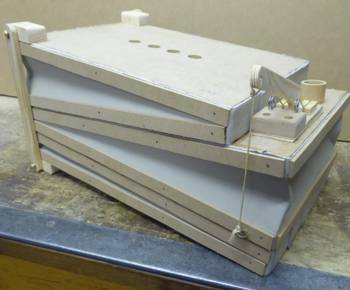 Each of the three bellows units can be tested separately before assembly. Three examples that I knocked up in a day! The only disadvantage with this system, that I can see, is that the reservoir moves backwards and forwards slightly during operation. I thought this may cause several problems, but fortunately this has turned out not to be the case. There were three possible problems that I was initially concerned about: The spill valve operation, the output connection, and the pressure spring. The spill valve is easily solved by operating it with a length of cord connected to the bottom of the reservoir. The sideways movement of the reservoir top board then has no effect. Internal spill valves are often operated in this way, so this is nothing new. The output connection on many organs is by a flexible tube to the reservoir top board, which moves up and down. This does not cause any problems. On this system, the movement is mostly sideways and I wouldn't expect it to cause any problems either. If there are any problems, it would be a simple matter to re-arrange the output tube to minimise the flexing. For instance it could be arranged to form a loop so that the loop absorbed any movement. An alternative would be to take the output from the bottom reservoir board, as this just tilts a bit. This would, of course, mean shortening the bottom bellows as well as the top one. Turn the spring in the diagram through 90 degrees so that it comes out towards you. The sideways movement then has no effect. In fact the pressure spring shown in the diagram would seem to be in the worst possible position, as it tilts up and down with the movement of the reservoir; but it still works well! Move the top of the spring further up and away from the reservoir. This reduces the angle of movement. Use two pressure springs, one facing left and the other facing right. Any sideways movement will then be cancelled out. Use tension springs between the top and bottom reservoir boards. They won't even know that the reservoir is moving! It would appear that the varying air pressure inside the top bellows would press up and down on the reservoir top board, and affect the pressure in the reservoir, but this does not happen. I'm not quite sure why it doesn't happen, but the pressure is rock-steady and there is no rhythmic pulsing at all. See the video for proof. All I would say is to make sure that there is minimum resistance to the air movement in and out of the top bellows.